MMC receives Brandon Hall Awards recognition! Posted on 1/3/2013 by Michael Management. 1 Comments. Brandon Hall recognized the Michael Management Corporation in their latest 2012 Excellence Award for Best Advance in Unique Learning Technology. Now entering its 18th year, the Brandon Hall Group Excellence Awards Program is the most prestigious awards program in the industry. Often times called the "Academy Awards" by Learning, Talent and Business Executives, the program was one of the first of its kind in the learning industry, which was pioneered in 1994. 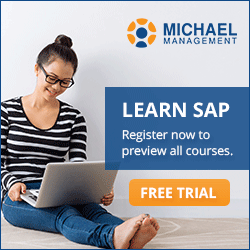 All of us here at Michael Management are excited about this recognition as it shows that our approach to online SAP training is truly unique in the SAP learning market. 1 Responses to "MMC earns Brandon Hall Awards recognition"
Many congratulations to MMC. It is an outcome of quality training MMC has been imparting over the years. Keep it up. Good wishes for MMC in the years to come.